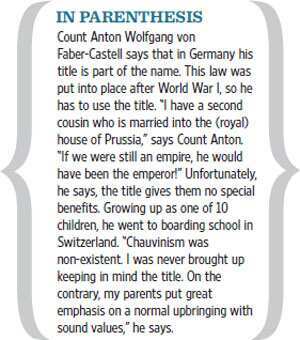 On a brief visit to Mumbai in the first week of November, Count Anton Wolfgang von Faber-Castell was already carrying at least 150 Christmas cards. The idea was to sign them whenever he was free, well in time for the year-end festive season. “If you don’t hand write them, don’t send them," he says. It’s not his version of a campaign to get more people to write, though as chairman and chief executive officer of Faber-Castell AG, the stationery company headquartered in Stein, Germany, he would probably prefer that over emails. But Count Anton’s habit is more of an old-fashioned etiquette that’s easy to explain. Count Anton is tall, in a dark suit in which I fail to see a Faber-Castell pen peeping out of the coat pocket. He does not smile much and perhaps because of his height and the low seating, struggles to find a comfortable enough position in the course of the meeting. We meet at Taj Lands End, affectionately called a “sundown" meeting by his office staff, but by the time we do sit down, it’s already dark outside. Faber-Castell has been present in India since 1998, an association that was propelled by Count Anton, who saw Asia as the next big market. His father, he says, was the one who pushed the business in Latin America. Count Anton also came to India first, preferring it over China, because of the English language. Today, he is not entirely satisfied with their business in India, but he is not displeased either. “I wish it would go faster," he says about the growth. “But it’s not so easy in India, particularly, to get the distribution right. But we have some excellent opportunities. If I look at our foreign competitors, nobody’s been able to establish their own company, including manufacturing processes. It’s all relative, isn’t it? If you are satisfied, then something is wrong. So I am, in principle, not satisfied. We have great potential, so we should grow faster. We have been growing 15-20% on a small base." He says the challenge for the company is visibility and communication. He has already been asked twice about getting some celebrity endorser for the company during this trip to India. Though the company brochure carries endorsements from people like Vincent van Gogh, there is nothing to connect to the current generation of Indians. “From a German point of view, I would be reluctant, but from an Indian point of view, maybe it’s a good idea. We will pursue it. We should become more open and creative regarding the means to communicate the brands and products, which may differ from country to country," he says, thoughtfully. I ask him what makes the company tick or even survive for over two centuries, remain relevant and continue to stay within the family. “You can learn from the Castells," he says carefully, in his clear German-accented English. “In that, you have to make up your mind whether to survive for a long time or build an empire which might fall apart next generation. If you like to keep something long term, you have to be cautious with financial commitments. The objective is the company stays in family hands, but each generation has to work for it; you can’t take it for granted." Though the company has survived wars and revolutions, it has also staved off threats of acquisition. Count Anton says he has now made it completely clear that they are not for sale. Even though it’s privately owned, Faber-Castell AG functions like a corporate firm, with independent, renowned outsiders on board. “What you always have to keep in mind is that companies are never destroyed from outside but from the inside—through arrogance, leniency, strategic mistakes and pompousness," he says. Count Anton himself did not have a seamless transition into the company. 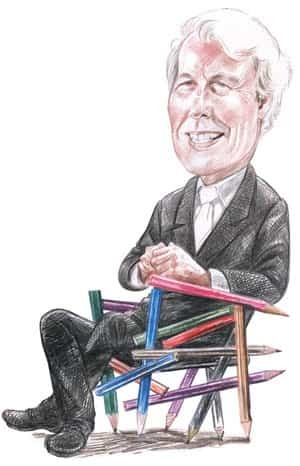 After getting a degree in law from the University of Zurich in 1966, he interned with a lawyer for a year and then with Faber-Castell in Stein, Germany, again for a year. He ventured into investment banking in 1971 in London and New York, later with Credit Suisse First Boston and White Weld Ltd, before coming back to the family business in 1978. “I went to another company to make my own career and came back because my father got sick, with prostate cancer," he explains. That’s not Count Anton’s only challenge. In a digital world, where cutting costs in offices means stationery is the first thing to go, where emails have already replaced the post, where a notepad is a computer software and a paperless world is looking increasingly realistic, what is the future of stationery? “It will probably last longer than we believe," says Count Anton. “The question is in what quantities. It was already my concern 30 years ago with the pencil business which, to my surprise, is stronger than ever. One of the reasons is because pencils, especially coloured, are needed for education, they don’t dry out, last forever and are environmentally friendly. “In Germany, for instance, I wouldn’t say the business is growing but it’s stable. Globally, colour pencils are growing because of education and demand in developing countries. Children might start early with computers, but as we know from brain research, it’s important that children use their hands for motor development and mental skills. “There was a dream of a paperless office, which has remained a dream. Where there is paper, there is the need for pencils. Colour, including artist pencils, will remain for 50-100 years because they have special features but in limited quantities." Pencils are Faber-Castell’s most prolific product—the company manufactures two billion black-lead and colour pencils a year, and is the world’s leading maker of wood-cased pencils. It’s also the product that brought the company to Asia-Pacific some years ago, given the young population in the region and the growing demand for education. For an ageing Germany, like the rest of Europe, Faber-Castell focuses on luxury products, though Count Anton dislikes using the word. “There will be a trend (in the future) to buy more luxury products with more money around in developing countries. Particularly for men, there are few status symbols: a watch, a pen, maybe cufflinks. We decided to enter the field in 1993 with a small line of high-priced pencils. We would have started with fountain or ball pens, but we would have been in competition with Mont Blanc and the others. With a luxury pencil, everyone was surprised." He leans forward with a rare smile and says: “You know why people have an affection for our products? Because they are, still in some ways, reminded of their childhood."